Done a few basic mods to your Subaru WRX? Not interested in the hassle and expense of going for a front-mount 'cooler? Well, here's an article you'll be interested in - the flow bench figures and thermal efficiency of ten different top-mounts for Subies! All WRXs come factory equipped with an air-to-air intercooler positioned above the engine/gearbox. In this arrangement, a forward-facing bonnet scoop catches outside air while the car is moving and forces it into the top of the intercooler core. Once the cooling air has passed through the core fins (and heat exchange has taken place) it then exits the lower side of the core and joins the under-car airflow. Version 2 WRXs (the MY94-96 series first introduced to Australia) have a smoothly contoured bonnet scoop feeding the top of the intercooler. Note, however, the intercooler core does not receive the full airflow from the scoop, as a portion is used to cool the nearby turbine housing. In order to achieve adequate clearance against the firewall, these early WRX intercoolers are mounted at a peculiar clockwise angle. Charge-air enters the 'cooler through a single opening in the rear end-tank, while a blow-off valve is incorporated in the plastic pipe that feeds the unit. Version 3-4 WRXs (MY97-98 models) carry a revised bonnet scoop that directs its entire airflow to the intercooler core. Furthermore, Subaru reengineered the intake manifold so the throttle is set further forward - this creates more space to fit a larger intercooler between the firewall. Not surprisingly, therefore, the Version 3 intercooler core is longer than its predecessor and there was no need to cram it in at a clockwise angle. In addition, dual charge-air entries are cast into the rear end-tank (probably to provide even airflow and heat distribution through the core) and an all-new Y-shaped feed pipe was created. The blow-off valve arrangement was also revised - a new BOV was connected to a right-angled pipe on the front end-tank. The Version 5-6 (MY99-00) maintains a similar intercooler layout but with some subtle changes. Most importantly, the core is equipped with much denser external fins and revised internal fins - both changes presumably enhance charge-air cooling. Again, the blow-off valve arrangement was also altered for the Version 5-6 - a cast metal valve can be found bolted directly to the front end-tank. Today's Version 7 (MY01 and MY02) WRX is a much larger vehicle and, again, this has created space for a bigger intercooler. The Version 7 core is wider and slightly longer than the previous model, plus its internal and external cooling fins are revised - note, also, the internal airflow tubes are wider than those used in previous models. The blow-off valve design is updated (but remains bolted to the front end-tank), while the core is fed air by a newly profiled bonnet scoop. 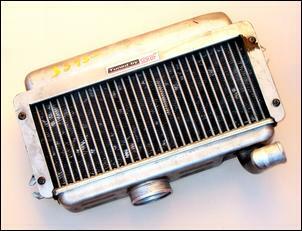 There a few reasons why Subaru adopted a top-mount intercooler position for the WRX. 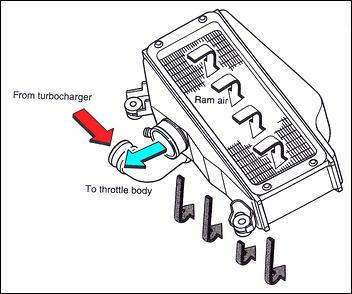 The EJ20 turbocharger is located a long way back in the engine bay and this makes routing metres of intercooling piping to and from the nosecone impractical. Instead, the compact top-mount arrangement was given the go-ahead; this provides good throttle response (due to a relatively short intake tract) while also minimising weight, complexity and cost. Whenever your WRX is crawling along in traffic its underbonnet temperature goes ballistic. 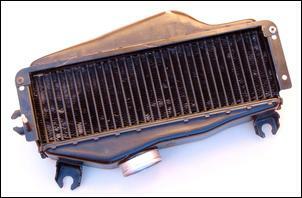 This underbonnet heat, naturally, rises and saturates (aka heat soaks) the air-to-air top-mount intercooler core. That means - if you nail it after sitting in traffic for a few minutes - the already hot intercooler has no chance of exchanging charge-air heat to its cooling fins. Not only will the car feel slower in this scenario, it's a proven recipe for detonation (as many WRX drivers have found out!). To compare the airflow capacity of our ten Subaru top-mount intercoolers we called upon the services of a local flow bench operator - Frank Intini of F&M Cylinder Heads. Once we had the appropriate flow bench adapter fabricated, Frank fitted the large diameter outlet pipe of each 'cooler (the end that connects to the engine throttle) to the base of his Superflow flow bench. Note that the flow bench was set to vacuum mode so the air passed through the intercooler in the same direction it would when fitted to the car. The flow results - quoted in cubic feet per minute (cfm) - were obtained at 28-inches of water test pressure. The weight of an intercooler is important because it represents the thermal mass of material that charge-air heat can be transferred to. A greater mass generally means greater heat-sink ability - and that's extremely important for the typical road car that cops the occasional short squirt. The volume of the heat exchange core (the section comprising the cooling fins only) is also important because it's a guide to the amount of contact the charge-air has with the cooling air. 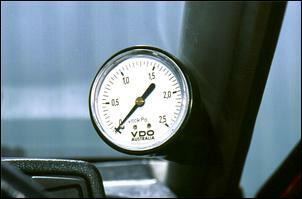 The larger the core volume the more chance the charge-air can be thoroughly cooled. 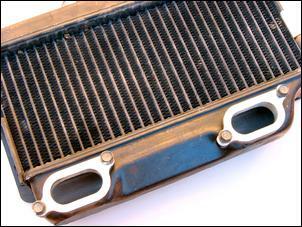 Combine these two aspects and you have a reasonable guide to intercooler heat exchange performance. Without question, the best way of testing intercooler airflow and heat exchange performance is to make on-car measurements. The airflow restriction across the core is quite easy to measure; simply subtract the measured post-intercooler boost pressure from pre-intercooler boost pressure. Intercooler heat exchange performance is also relatively easy to measure; just insert a temperature probe before and after the 'cooler and examine the temperature differential under varying conditions. So why haven't we performed on-car testing? 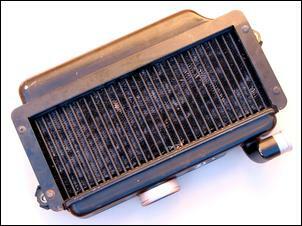 The Version 2 intercooler is immediately recognisable as the poor cousin in the WRX range. It's the smallest and lightest of the bunch, its end tanks and core section are oddly arranged and its core volume isn't particularly large. The plastic intercooler feed pipe (which is notorious for splitting at high boost) also flowed appallingly - installing it reduced flow bench figures by 50 percent! This imported Version 2 STi intercooler is a rare find. Visually, only the silver finish and a different rear end-tank shape distinguish it from the contemporary WRX part. 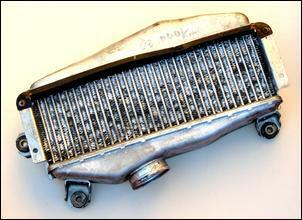 So how much better does the STi intercooler perform? Well, not much. A slightly larger charge-air entry into the rear end-tank allows a tad more flow than the standard WRX 'cooler - 285 cfm versus 282.7. Thermal mass and core volume, meanwhile, is identical to the stock WRX - pretty minimal. 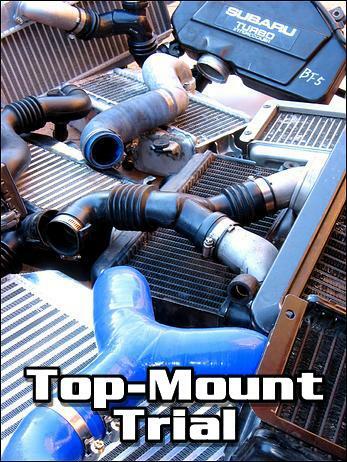 While the STi intercooler holds a slim flow advantage over the base product, its cast alloy/silicone hose feed pipe flows considerably better than the standard plastic part; the absence of a convoluted section (which causes massive in-pipe turbulence) is the major reason for this improvement. Once bolted together, the STi intercooler and feed pipe assembly outflows the standard WRX combo by more than 50 percent - a good net gain. Note that the Version 2 STi feed pipe won't bolt onto the conventional WRX intercooler (damn!). This second-hand aftermarket intercooler for Version 2 WRXs - which appears to be an early AVO item - has impressive thermal mass and core volume. At 5.15 kilograms it's nearly double the mass of the WRX/STi units - much of this gain seems to come from the 30 percent thicker bar-and-plate core section. In terms of airflow, the aftermarket intercooler outdoes the standard one by a considerable 16 percent - excellent considering it's all kept within the limited space available in a Version 2 engine bay. 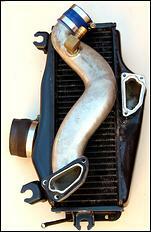 Next, we tested this intercooler with the matching AVO cast alloy feed pipe. Interestingly, fitting this pipe slashed the overall flow figure to below that of the STi assembly. This comparison is a bit deceptive, however. The entry to the AVO feed pipe is designed to fit flush with the internal diameter of the turbo compressor nozzle, while the STi entry slips over the outside of the compressor nozzle; that means the entry to the AVO feed is smaller than that of the STis. On the flow bench, the relatively small cross-sectional area at the entry to the AVO feed caused a considerable disadvantage, but - once fitted to a car - we'd expect barely any flow difference between the pair. 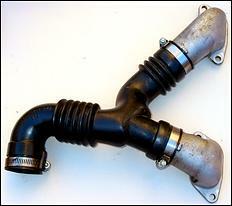 The AVO feed pipe is also compatible with standard Version 2 WRX intercoolers. Subaru took a major step up in the size of the Version 3 core - and the benefits show. Compared to the earlier Version 2 WRX intercooler, airflow is up 10 percent, thermal mass is around 12 percent greater and the heat exchange volume is 18 percent larger. While this is certainly an impressive upgrade (for an OE part), bear in mind the aftermarket Version 2 core still performs better in every aspect. Interestingly, bolting on the standard Version 3-4 WRX Y-shaped feed pipe (which is a combination of cast alloy and plastic) caused nearly a 50 percent flow loss - similar to that seen on the Version 2. Again, we can blame a portion of this restriction on the convoluted section of the plastic feed pipe. 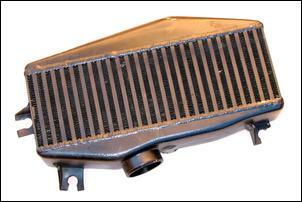 Ah-ha - here's an intercooler that many WRX owners are prepared to spend big money on. But is it worth it? On the scales, the imported STi 'cooler is virtually the same weight as the WRX equivalent and the core dimensions are identical. In short, there's no heat exchange advantage to be seen. Well, the STi intercooler flows 315.7 cfm at 28-inches of water - about 2 percent better than the basic WRX core. Again, we're talking about a minimal gain. The reason for this slightly superior flow appears to be linked to the fact the STi intercooler doesn't have the recess found on the left side of the conventional Version 3-4 WRX rear end-tank. While the Version 3-4 STi 'cooler is barely any better than the WRX part, once again we'd expect its associated silicone feed pipe to out-flow the normal plastic one. Unfortunately, though, the STi Y-shape feed pipe was unavailable for our tests. 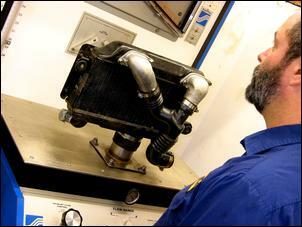 In Part Two of our test we'll look at the five remaining intercoolers and summarise the results - don't miss it!